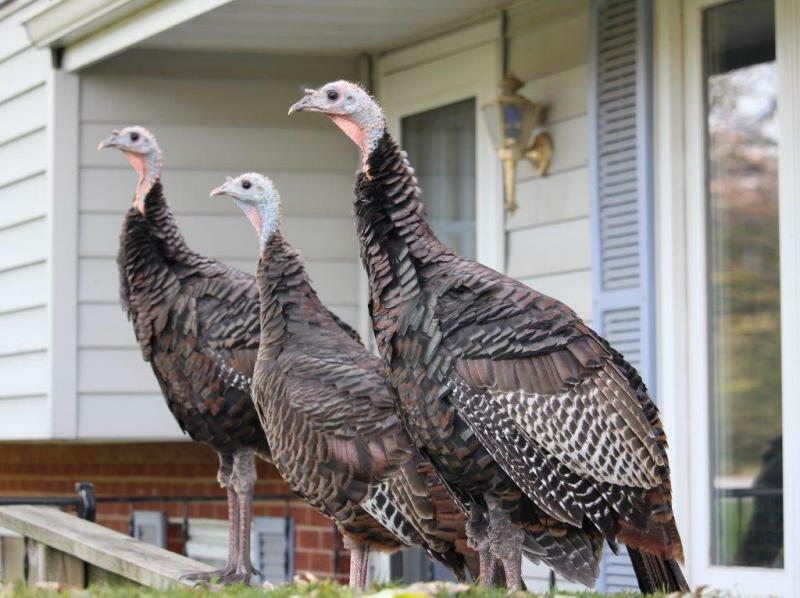 A trio of turkeys soak up the rays on the perch of a porch in the Raab/North Linden area in Normal. 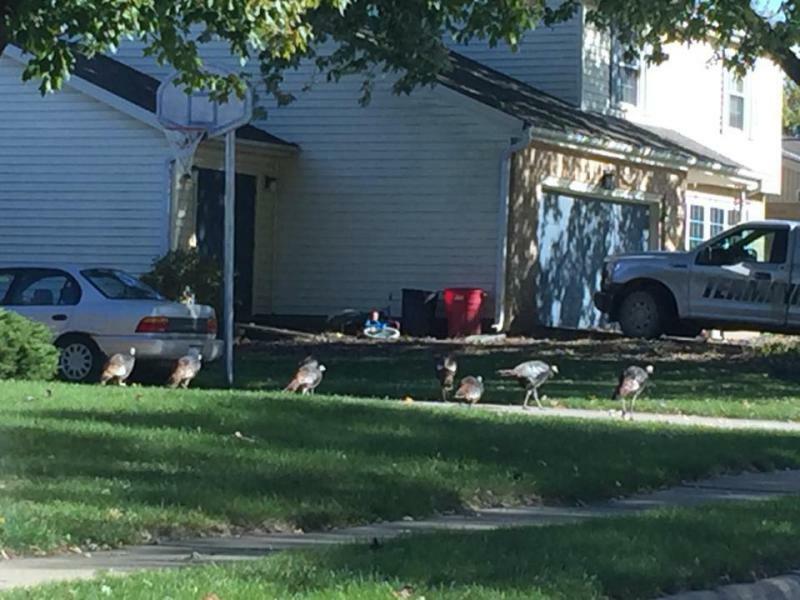 A rafter of turkeys were spotted on School Street in Normal. 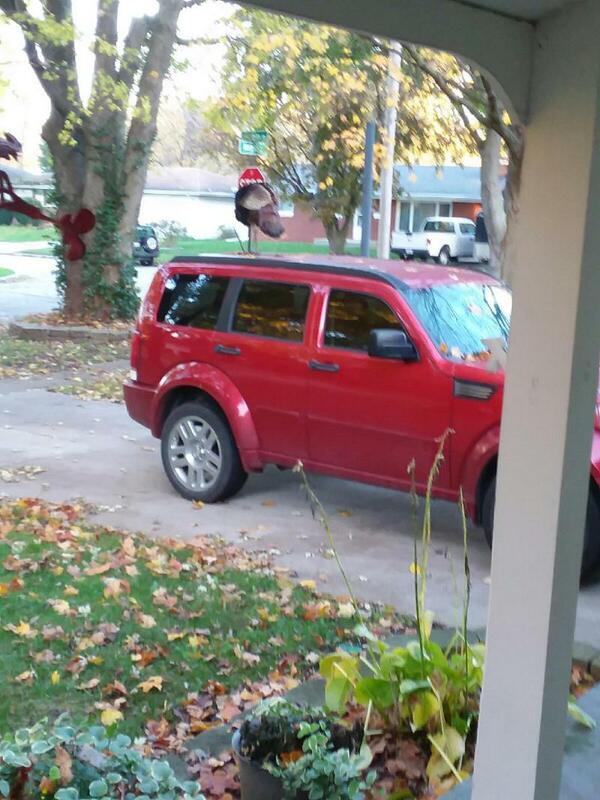 A wild turkey was discovered on Maple Street in Normal last Monday, taking cover on the roof of a car. 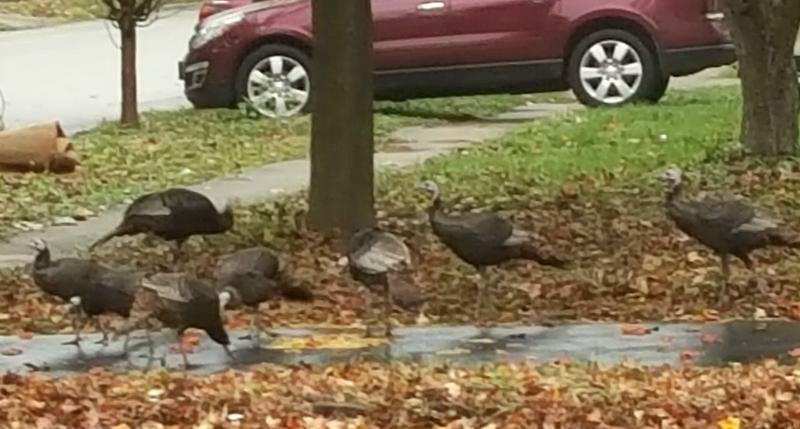 Three wild turkeys were perusing around Irving and Oak Street in Normal last weekend. A team of turkeys enjoyed a prolonged stay of a week near Heritage Road in Normal. Why did these turkeys cross the road? To get to the other side of the intersection of Vernon and Linden on Oct. 28. 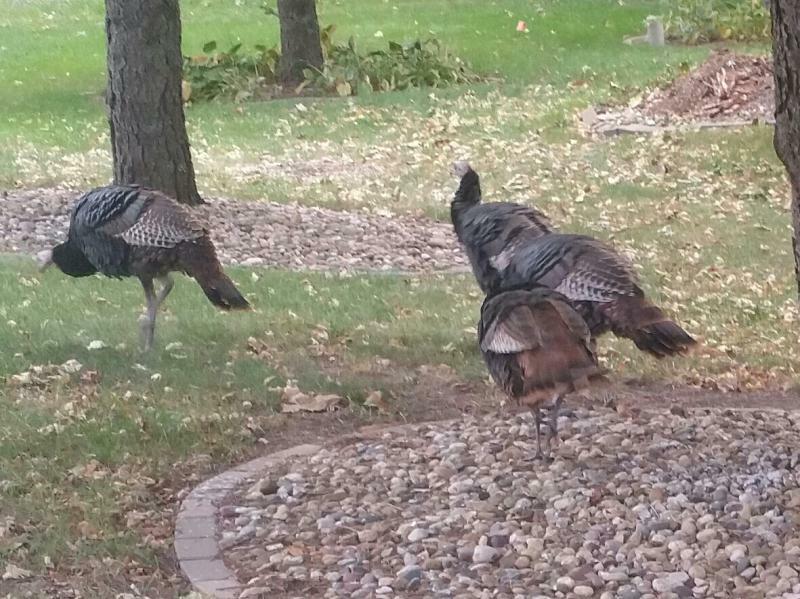 Three turkeys prepare for their closeup Nov. 1 on College and Grandview in Normal. A turkey enjoys the fall leaves Friday afternoon on Colton Avenue in Bloomington. 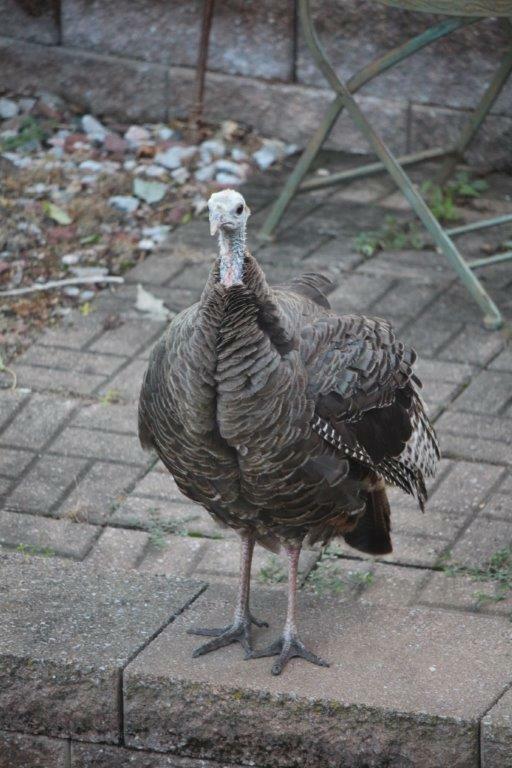 The "Mama Turkey" has been a frequent flier at the Prossers' residence in the Raab/North Linden area in Normal. 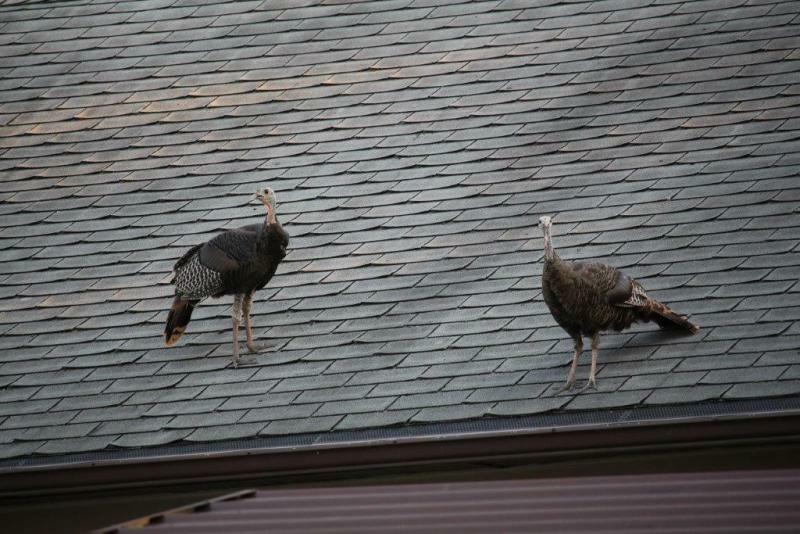 A pair of turkeys enjoy a birds-eye view from a roof Sept. 28 in the Raab/North Linden area in Normal. 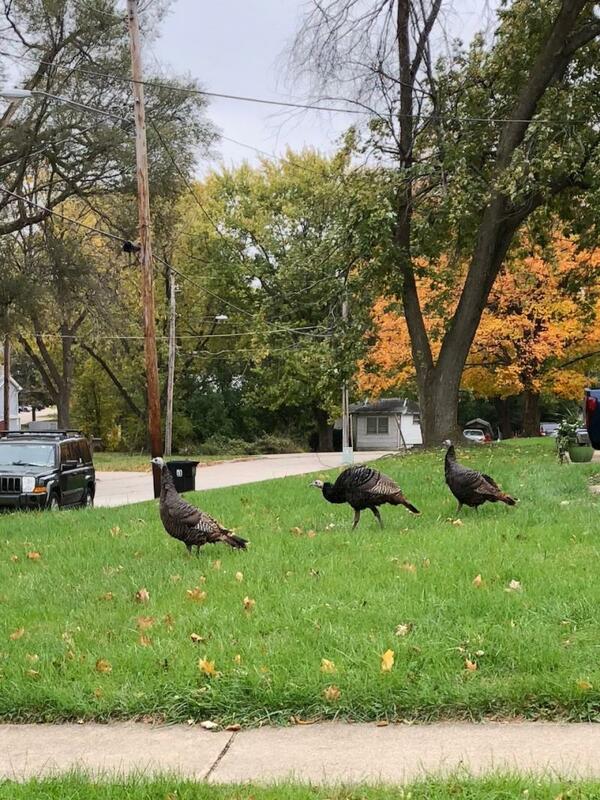 If you’ve been gobbling up all of this wild turkey talk in Bloomington-Normal as of late, you might want to thank Cyndi Prosser and her neighbors in north Normal. Prosser lives near Raab Road and Linden Street, not far from Constitution Trail. That’s where a female turkey set up her nest last spring, only to re-emerge this summer with seven baby turkeys. Together, they’ve been walking around Bloomington-Normal, captivating confused residents. Prosser and her husband, John, first spotted the “Mama Turkey” on May 3. It took a little time to figure out it was a turkey, she said. (After all, they do live pretty close to the Pheasant Ridge subdivision.) Mama Turkey stuck around for a week, enjoying the sunflower seeds John was putting out for the squirrels. The squirrels didn’t like that. “A week and a half later, she just disappeared,” Prosser said. They worried she’d been eaten by a coyote. Thankfully, there was no fowl play: In early July, Mama Turkey returned—this time joined by her seven babies. The Prossers and their neighbors continued feeding them. Life with the turkey family was pretty entertaining, Prosser said. She got to watch them learn how to fly, eventually getting all the way up into their maple trees before flopping back down to earth. (That really upset the squirrels.) They even found their way onto a neighbor’s roof for a party. “It’s been really fun,” she said. 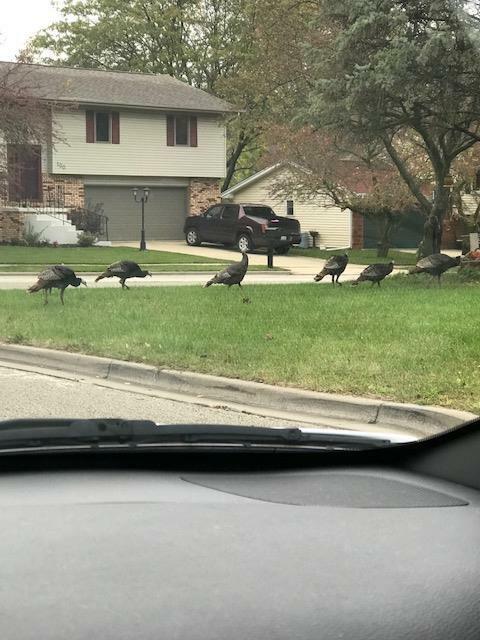 Around the third week of October, the turkeys left the neighborhood. Ever since, they’ve been spotted all over Normal, mostly near College Avenue between Towanda Avenue and Linden. Last week, GLT asked Illinois State University associate professor (and bird expert) Angelo Capparella to explain why wild turkeys were suddenly showing up in Bloomington-Normal. He mentioned Mama Turkey’s nesting in north Normal, noting it’s apparently the byproduct of a successful state conservation effort. The turkeys could not be reached for comment on this story. 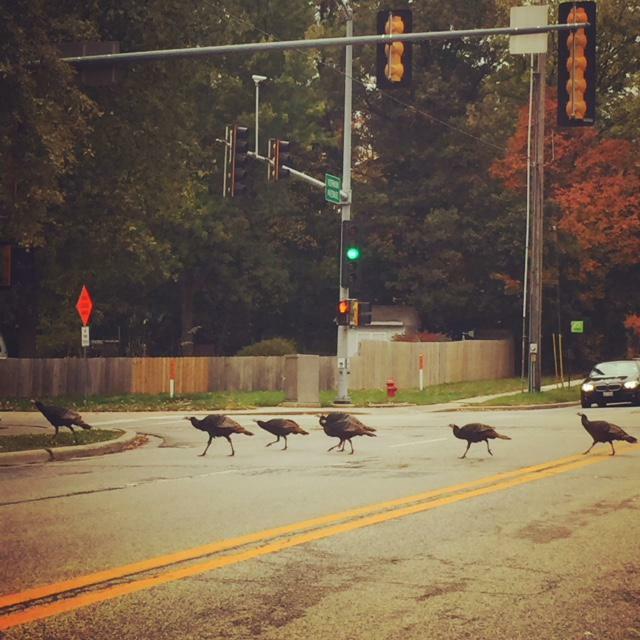 Why Are Wild Turkeys Wandering Through Bloomington-Normal? If you’ve seen a flock of wild turkeys wandering through your front yard recently, no, you’re not going crazy.